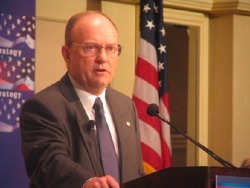 Lawrence Wilkerson is Distinguished Adjunct Professor of Government and Public Policy’s at the College of William & Mary. His last positions in government were as Secretary of State Colin Powell’s Chief of Staff (2002-05), Associate Director of the State Department’s Policy Planning staff under the directorship of Ambassador Richard N. Haass, and member of that staff responsible for East Asia and the Pacic, political-military and legislative affairs (2001-02). (1989-93), and Director and Deputy Director of the U.S. Marine Corps War College at Quantico, Virginia (1993-97). Wilkerson retired from active service in 1997 as a colonel, and began work as an advisor to General Powell. He has also taught national security affairs in the Honors Program at the George Washington University. He is currently working on a book about the first George W. Bush administration. Col. Wilkerson was the featured speaker at the Committee for Responsible Foreign Policy’s October 10, 2018 event on The Impact of War on Military Readiness. and is moderating the veterans panel at the April 2, 2019 conference on The Future of War Powers.